eDB360 takes long to execute! If you are considering executing eDB360 on one of your databases, before you do please execute first a light-weight “pre-check”, which is basically a small script that reports on the state of Active Session History (ASH) stored into the Automatic Workload Repository (AWR). Bare in mind that ASH and AWR are part of the Oracle Diagnostics Pack, so consider such “pre-check” only if you have a license for such Oracle Pack for the target database. You can execute stand-alone the awr_ash_pre_check.sql script available as free software in GitHub within edb360-master or cscripts-master. If downloading eDB360, you can find awr_ash_pre_check.sql under the edb360-master/sql directory, and if you download the cscripts set, then you can find awr_ash_pre_check.sql under cscripts-master/sql. Retention period of AHR, frequency of Snapshots, AWR Baselines, and similar. Age of CBO Statistics on the main table behind DBA_HIST_ACTIVE_SESS_HISTORY (WRH$_ACTIVE_SESSION_HISTORY) and its partitions. State of CBO Statistics for WRH$_ACTIVE_SESSION_HISTORY segments: Are the statistics Locked? Are they Stale? Size of WRH$_ACTIVE_SESSION_HISTORY segments, with range of Snapshots per segment (partition). Are they outside the desired retention window? Creation date and last DDL date for WRH$_ACTIVE_SESSION_HISTORY segments. So expected partition splitting can be verified. Take for example result below. It shows that current ASH repository contains 320.6 days of history, even when in this case only 30 were requested (displayed on an upper part of report not shown here). We also see ASH is 16.4 GBs in size, where normally 1-2 GBs are plenty. We can conclude last partition split (or simply last DDL) is 289.7 days old, where normally only a few days-old are expected. This pre-check sample results on a ballpark estimate of 127 hours to execute eDB360. In other words, if we had one month of history (as current AWR configuration requests) instead of 320.6 days of history, then ASH repository would be less than 10% its current size and eDB360 would be estimated to execute in about 13 hours instead of 127. Keep in mind this “pre-check” provides a ballpark estimate, so an actual execution of eDB360 would take more or less the estimated time. 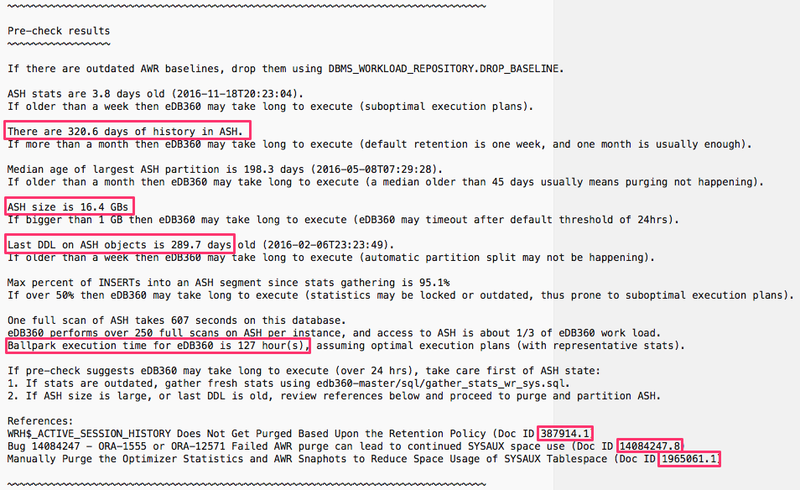 What to do if eDB36o is estimated to run for several days like in sample above? What I recommend is to fix ASH first. This process requires to read and digest at least 3 My Oracle Support (MOS) notes below, but it is not as bad as it sounds. You want to follow this path anyways, so any diagnostics tool that relies on ASH from AWR would benefit of the much needed cleanup. Let’s say you executed an older version of eDB360 and it took long (newer versions starting on v1620 perform an automatic pre-check, and if execution is estimated to last more than 8 hours, then it pauses and ask for confirmation before executing). If you executed an older version of eDB360, or simply your execution took longer than expected, review next the following files included on the directory from where you executed eDB360 (edb360-master), or stored within the edb360_*.zip file generated by eDB360 as it executed. If you find one of the SQL statements from eDB360 is taking more than a few minutes to execute, suspect first outdated CBO statistics on the Data Dictionary objects behind such query. Or if volume of data accessed by such query from eDB360 is large, suspect AWR data not getting purged. In either case take action accordingly. If you cannot make sense of the information provided by these diagnostics files above, then contact eDB360 author at carlos.sierra.usa@gmail.com. Keep in mind that execution time for eDB360 really depends on the state of several metrics stored in AWR, where ASH is the most relevant piece but not the only one. Think outdated statistics and outdated metrics! How do you avoid the following prompt when trying to run edb360 in the background? *** eDB360 may take over 8 hours to execute, hit “return” to continue, or control-c to quit.